“Can the EU Survive?” Meeting Report Oct 17 – the speaker survived ! 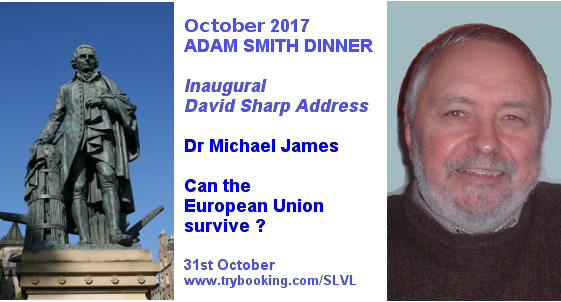 Our former President and inaugural David Sharp Orator Dr Michael James has provided a text of his speech delivered on 31st October 2017 at Cafe Boheme. Many apologies. The year 2018 has slipped by and the Adam Smith Club has not given the necessary intellectual and social kick up the rear to statists and those who just prefer the state to the individual. We did have two near events – but with speakers or dates that didn’t work. The President has had some health issues – but we are all back on deck. The Editor has placed a request for anyone who likes wine, cheese, conversation and committee work to put up their hand to be considered for the Club committee, as age and changing cities thin the current ranks. 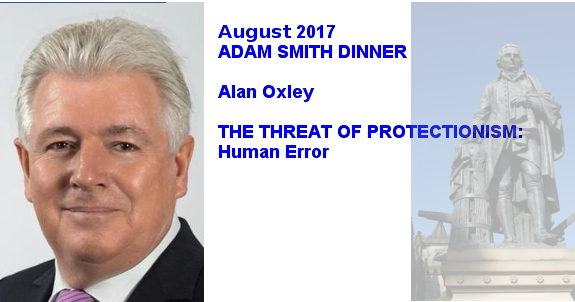 Please contact the Hon Secretary by email (asmith@adamsmithclub.org) or by phone (0403 933 786). We hope to have at least two events more before the federal poll and a full set of dinners for the year! CAN THE EUROPEAN UNION SURVIVE? – Michael James was President of the Club from 1998 to 1999. 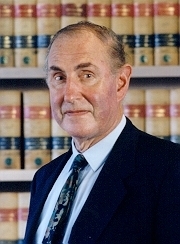 He lectured in politics at La Trobe University from 1974 to 1988. He edited Policy for the CIS from 1989 to 1993, and was the founding editor of Agenda for the ANU from 1994 to 1998. Despite Brexit and the emergence of Eurosceptic political parties across Europe, the EU continues to pursue its project to build a bureaucratic super-state marked by heavy uniform regulation and lack of accountability. What’s wrong with protectionism? How about “managed trade”? How protectionist is Trump? What does China’s “One Belt One Road” imply? What are the implications of Brexit? How will this affect the rest of Asia & Australia? What effect are minor parties having in Australia? Alan Oxley will cover this and more at the dinner. Alan Oxley is Chairman of the APEC Studies Centre at RMIT University and Managing Director of ITS Global, a consultancy which advises on trade, investment and sustainability. He was a former Ambassador to the General Agreement on Tariffs and Trade, the predecessor of the World Trade Organization. He is a regular commentator in the media and has published two books – The Challenge of Free Trade and Seize the Future. He is also Chairman of World Growth, a free market NGO.